Last time I checked, her name was Val McClatchey, not "Todd Beamer Foundation". 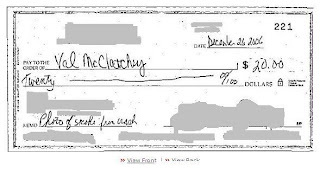 So she can't very well deposit these checks into her own account. However, if all the checks are made out to the charity, how does Val get reimbursed $2 per print she keeps to cover for supplies and shipping and how is she able to keep some of the proceeds she admits keeping in order to help fight her lawsuit against the AP? I’ve pointed out before that in at least one occasion, a magazine that had advertised Val’s photo for sale did not say to write checks out to the Beamer Foundation, but told people to make it out in Val’s name. I’ve also argued that it’s possible that people going to her work to buy a print might be able to pay cash for it. Remember, it’s by the honor system that Val forwards her proceeds. Let’s just hope Val is true to her word and forwards $18 from this check to the Beamer Foundation.